Meet my nemeses: Doctor Fiscal Ruling. The Incredible Unbalanced Tax Treaty. OffshoreStructureWoman. 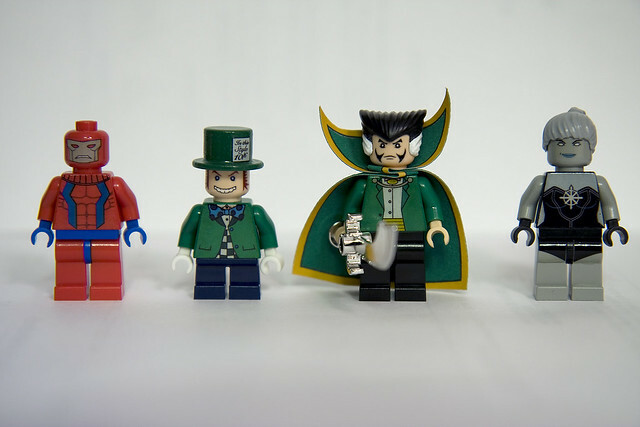 One key problem, when proposing improvements to tax policies and practices, is that of identifying a clear villain: the bogeyman ‘loophole’ or financial technique that is responsible for whatever one doesn’t like about a deliberately-engineered tax outcome. For some it’s the structure deployed by a multinational company, like Apple Inc’s famous ‘double Irish with a Dutch Sandwich’. For others it’s a governmental tax-carveout that makes a tax-reducing structure or strategy work: the U.S. ‘check the box’ opt-out, for instance. For others still, it’s a tax haven — the existence itself of a low-tax environment in a key jurisdiction, like Mauritius or Jersey. The problem is that — in the real world — almost any deliberately-engineered tax outcome (that’s most of them, for good or for bad, at least when we talk about corporate income tax paid by multinationals) relies upon the combined interaction of several different tax laws, regimes and behaviours. It’s almost never simply the sole product of a government policy, or an ingenious taxpayer, or an international tax standard. ‘Shut Tax Havens’ fits nicely onto a banner — and I think its underlying opposition to extreme tax competition is pretty rational — but in fact any of the multitude of controversial tax outcomes that we’ve seen over the years, from Apple-gate to SAB Miller-gate, is produced by the interaction of a whole raft of other things – from domestic tax laws to the behaviour of taxpayers themselves. This necessary interaction doesn’t remove the responsibility of those (often deliberately) creating the laws, policies, structures, behaviours and rulings. But it does explain why the list of policy demands from expert-driven campaigners like the Tax Justice Network seems so long, and so bereft of a grand unifying global campaign goal. It’s long because it has to be. This is something I learned, as an international taxation ingénue, on day one of the (excellent) Principles of International Taxation course at the IBFD. My vision of international tax at this point was as a kind of fiscal astronomy, for which I imagined the OECD Model Tax Convention and its commentaries served roughly as Newton’s Principia. I thought we would be learning how the high priests of international tax use this sacred text to analyse the constellations of related companies and partnerships set out in the spidery diagrams generally used to map out international tax structures: boxes denoting legal entities (companies, partnerships and trusts); lines between them showing relations of equity and debt, and flows of income, between these entities. Apply the provisions of the Model Convention to each relation and entity, and you can have a good guess at the tax impact of the structure. Or so I thought. Day one was Permanent Establishments. Like good novitiates, we started with catechism: we dutifully worked through Article 5 of the OECD Convention (and, to be fair, also its more expansive UN homologue). But Article 5 quickly led us deep into a set of more pedestrian questions I’d never thought had anything to do with tax. Where do seconded employees sleep? Can they prepare food in the offices where they work, or only hot drinks? Is their merchandise stored under their desks or in a separate room? Who has the keys to this room? From the astral heights of the OECD’s hushed conference chambers in Paris, I suddenly found myself considering where Viv from HR kept the kettle. Of course, this should all be obvious. Anyone who’s worked through the IR35 rules, for instance (or considered the VAT-ability of a Cornish pasty, hot or cold…) will know that mundane details matter. If this is true of employment and sales taxes, why should international income tax be any different? However much the underlying law may be the ultimate result of grand global fiscal politics, its application involves — or should involve — the mundane realities of how a taxpayer’s actions and activities fit with the detailed letter of national tax laws. And as a result, even the most abstract financial transactions can (indeed must) be surprisingly performative. Take, for instance, the set of internal currency transactions within Australian subsidiaries of News Corp famously leading to a A$2bn tax loss and an A$882m rebate in 2012, which actually involved three men going into a room, one physically handing a cheque for 2.94 billion Australian dollars to another, that man handing it to a third, and someone going round the corner to a bank branch to pay it in. This was ultimately a circular transaction within a corporate group (as the Australian court puts it succinctly: “News Finance was both the drawer of the cheque and ultimately its holder. News Finance presented the cheque, and its banker both debited and credited News Finance’s account accordingly”). But however abstract the fiscal astrophysics involved in confecting this entirely internal transaction, it still required actual pens, real paper, and even a human being pounding the pavement to cash the cheque (as beautifully recorded by the court, someone had to nip round the block with the A$3bn cheque to the Commonwealth Bank branch on the corner of Pitt Street and Martin Place in Sydney). I was reminded of this earthbound trajectory late last year when looking again at one of the unresolved questions in Sweet Nothings, a 2013 examination by development campaigners ActionAid of the tax practices of Zambia Sugar Plc, the Zambian subsidiary of the Illovo Sugar group, owned by food and agribusiness multinational Associated British Foods; which I helped to write. An early ‘tax exposé’ (which ABF vociferously disputes – in a statement responding to a draft of this blog post, the company emphatically denies that Illovo has “engaged in anything illegal, immoral or any way designed to reduce the tax rightly payable to the Zambian Government”), Sweet Nothings’ analysis was dominated by questions of treaty shopping: looking at how income moved through subsidiaries in Ireland and the Netherlands was affected by the tax treaties between Zambia and those jurisdictions. If there was a clear villain, it was the antiquated treaty network connecting Zambia to ‘treaty havens’ in Europe and the Indian Ocean, even more heavily residence-state-biased than the OECD Model Convention. 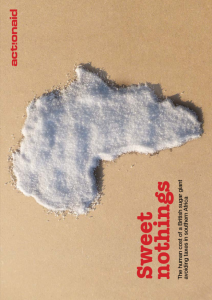 When Sweet Nothings was being written, there was one unresolved question: the Illovo Group’s use of a Mauritius subsidiary, Illovo Group Marketing Services Ltd, to which Zambia Sugar paid the equivalent of several million dollars every year under an agency agreement for arranging export contracts for the Zambian company’s products. Illovo claimed that export contracts were arranged through this Mauritius subsidiary for reasons of risk and exchange controls: “[f[inancial, political and supply chain risk make direct sales of sugar from African producers to European customers commercially difficult, if not impossible. Exchange control issues prevent these services being provided directly from South Africa.” They also insisted that the Mauritius subsidiary was being paid for real services: “the provision of trade contacts with customers in the European sugar market, transportation of sugar to Europe, foreign currency management and the availability of cost effective credit terms”. It was nonetheless clear that, beyond instructions, the actual work wasn’t being done substantially from Mauritius: the director of Illovo’s Mauritius holding company told ActionAid that Illovo Group Marketing Services Ltd had no personnel in Mauritius, and that in practice management, procurement and other functions took place at the Illovo Group’s headquarters in South Africa. 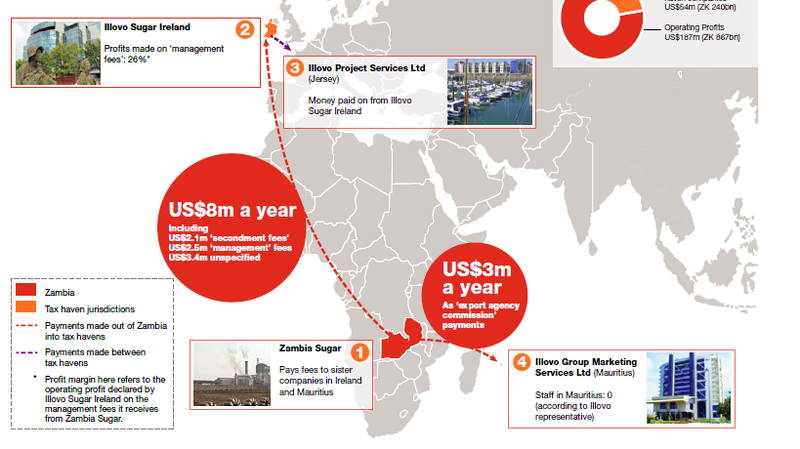 And as the Illovo Group themselves wrote, though the Mauritius company’s board dutifully met in Mauritius, it “contracts with Illovo in South Africa for the provision of specialist expertise”. But as ActionAid’s report noted, it wasn’t clear that there was an immediate Zambian tax advantage to routing export agency commissions through Mauritius rather than paying them directly to the South African head office. ActionAid assumed that Zambia Sugar was paying the standard 15% Zambian WHT on its payments to Mauritius, equal to the 15% tax rate that Zambia Sugar was then paying on all its profits. There would therefore be no additional revenue loss to Zambia from Zambia Sugar making tax-deductible payments to Mauritius, since the 15% WHT matched the 15% CIT rate for which Zambia Sugar qualified. ActionAid did suggest that the imminent entry into force of a new Zambia-Mauritius tax treaty, signed in January 2011, might create a tax advantage in the future. The new treaty’s Article 21, conforming to the residence-state bias of the OECD Model Convention, would prohibit Zambian withholding tax (WHT) on ‘other’ income types like sales commissions, thereby removing one plank of Zambia’s domestic protection against profit-shifting into or via Mauritius. But at the time of writing, ActionAid assumed that any reduction in Zambian corporate income tax liabilities from paying out commissions to low-tax Mauritius would be countered by the Zambian withholding tax. The Illovo Group agreed adamantly with this part of ActionAid’s analysis: “[a]s ActionAid have noted, there are no tax advantages to the arrangement”. And there we all left it. Fast-forward three years, and a ruling in the Zambian Revenue Appeals Tribunal, released last year, suggests that this wasn’t quite the whole story. (The ruling is a public document, but isn’t published in hard copy or online, so I’ve posted it here). The ruling indicates that in fact Zambia Sugar hadn’t, at least up to April 2011, been paying withholding tax on these payments to Mauritius. In November 2010 the Zambian Revenue Authority (ZRA) claimed that the payments should be subject to withholding tax — arguing that the payments constituted management or consultancy fees which were subject to withholding tax under Zambian domestic law. Zambia Sugar in turn challenged the ZRA in the Revenue Appeals Tribunal, arguing that these payments were a commission, which was not subject to withholding tax under Zambian domestic law until April 2011. The problem, then, is one of definitions in domestic tax law: definitions which both multinational companies and revenue authorities have at least some latitude to work against when defining and classifying inter-company payments. (Payments which, after all, may be primarily a construct of transfer pricing documentation). Just to underline the potential mutability in defining whether a payment is a consultancy fee, a marketing commission, a service charge or something else: the ruling shows that “[f]ollowing their discussions with Zambia Revenue Authority, [the ZRA] conceded in a letter dated 9th June 2011 that the scope of services [provided by Zambia sugar’s Mauritian sister company] contained brokerage services [rather than taxable management fees] to the extent of 22.05% of the total monies.” (How the ZRA arrived at this 22.05% figure, and whether it varied according to the actual services provided, isn’t made clear in the ruling). On the other side of the dispute, accounting for these fees appears to have been similarly mutable. When Zambia Sugar’s accounts began in 2011 to declare the company’s 2% export sales payments to Mauritius, they classified the payments under the column of “purchases and management fees” – even though the basis of Zambia Sugar’s appeal is that they are definitely not (taxable) management fees. The year after, the accounts instead describe the 2% payments to the Mauritian company as an “export agency commission”. More puzzlingly still, the ruling shows that the agreement for Zambia Sugar to start paying fees to its Mauritian sister company was made in April 2008. Yet these payments appear nowhere in Zambia Sugar’s published accounts for FY 2008-9 or 2009-10. Zambia Sugar only started to declare them in its published accounts from 2011 onwards (after the ZRA challenged the payment in November 2010). This is no small oversight: the payments to Mauritius constitute 2% of the company’s export sales, a little over 1% of the company’s turnover – at least €2m in most years. When I asked ABF about this non-disclosure earlier this month, they simply told me that “the related party transaction note in the Zambia Sugar accounts for 2009 and 2010 were incomplete. This was rectified in 2011.” (Though if that’s so, then the “rectified” 2011 accounts still neglect to state that there were payments to the Mauritian affiliate during the preceding FY 2009-10). Before this becomes a slug-fest more tedious than Batman vs. Superman, my point here is not to rehearse these arguments and counter-arguments. Rather, it’s to point out that Sweet Nothings conservatively disregarded an additional revenue loss to the Zambian exchequer based on the assumption that the tax effect of a tax-deductible payment to an affiliate in a tax haven would be determined primarily by the rules treating income in that tax haven, or the international tax treaty with that tax haven. In other words, by classic international tax justice ‘stuff’. In fact, in this case there was a Zambian revenue loss – one created not simply by the ‘tax-haven-y’ stuff of a low-tax jurisdiction or a residence-biased tax treaty, but also and primarily by the pedestrian business of payments characterized as falling outside a set of definitions in domestic tax law. As for the ruling itself: well, that’s another (unfinished) story. The Revenue Appeals Tribunal has, in the end, dodged the question. Three and a half years after the appeal was submitted, it has finally decided that the characterisation and taxability of the payments is outside its jurisdiction, arguing that it should in fact be decided by the ZRA’s Commissioner General before it can be appealed to the Tribunal. As of January 2017 the question evidently isn’t settled: ABF told me that “Zambia Sugar continues to engage with the Zambian Revenue Authorities through the appeals process to resolve the withholding tax position.” In any case, for future taxes the question may now be moot: the Mauritius-Zambia tax treaty is now in force, removing the ability of the ZRA to levy withholding tax on these payments regardless whether they are commissions or consultancy fees. Tax disputes like these show how slippery tax policy ‘villains’ are. Treaty law; the interactions of haven and non-haven domestic regimes; corporate structuring; and – far from least — the pedestrian choreography of companies’ inter-group contracts, payments and documents; all create a given tax outcome. For tax lawyers and accountants this is an obvious truism. For policymakers and campaigners searching for the magic policy bullet, I think it’s much less obvious. One might view this as a counsel of despair for revenue-seeking governments. They will never have control over the interactions of international and domestic tax law, and in any case some taxpayers will always be able to maneuver around them through the strokes of a transfer pricing documenter’s pen (to be clear, I’m not saying that’s what Zambia Sugar is doing here…). Alternatively, one might view it as a counsel of hope. Many revenue-poor governments, particularly in the Majority World, are systematically excluded from international tax rule-making, particularly at the OECD. But as Mike Durst has persistently argued, in a world where domestic tax regimes matter as much as international tax regimes, those Majority World governments can make at least some progress through bog-standard domestic measures: deduction limitations, more robust withholding tax regimes, transfer pricing safe harbours. They will, of course, face tax competitive pressures not to do so, and in any case can’t rewrite the transfer pricing system altogether. But with a bit of policy space, governments like those of Zambia and others should nonetheless be able to challenge a multinational’s arbitrary TP paperwork, recharacterize WHT-free payments, or limit the tax deductibility of fees to tax haven affiliates. Even with their (outrageous) exclusion from the OECD conference table.